With aviation buff Merian C. Cooper at RKO's helm by 1933, it must have been a cinch for staff to pitch an aerial theme to green light response. I bet some did meetings with him in flight scarf and goggles. The story here could be guessed at from credits alone, Eric Linden's name a tip he'll be the kid brother, probably to Bruce Cabot, maverick vet of the skies. 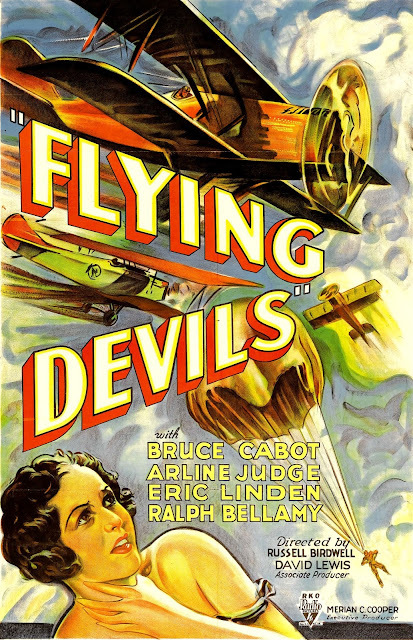 Flying Devils plays like warm-up for The Tarnished Angels, itself adapted from William Faulkner's novel Pylon, published in 1935. Did Faulkner go see Flying Devils in 1933 and get ideas? There's little else of outstanding interest here, but some (like me) who find any aero theme irresistible will watch and be gratified. Pic heroes that flew through the 30's carried scars from the Great War, airborne's Lost Generation a crowded fraternity. Youngsters thrilled to such and dreamt they'd grow up and be flyers, a more realistic prospect than gun-slinging or cattle-punching, latter the extent of what westerns could promise. No wonder that genre went briefly out of style when flying fads peaked. Is this director the same Russell Birdwell later responsible for (some might say guilty of) the hard-sell ad campaign for John Wayne's THE ALAMO? One and the same --- quite a varied career.